Almost FREE: Baskin-Robbins 31-Cent Scoop Tonight! As readers know, I love to tell you about free stuff. Usually, it’s legit, and sometimes–as with the free Snuggie promotion–it’s a bust (I never got my Snuggie, nor did many readers; sorry, but I said I wasn’t sure if it would work). But this one IS real. 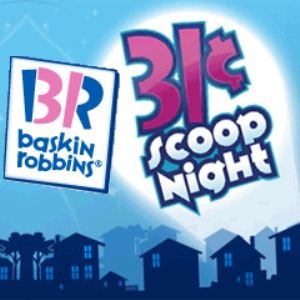 It’s 31 cent scoop night at Baskin-Robbins stores all over America, from 5:00 p.m. to 10:00 p.m., TONIGHT. No, it’s not free, but close enough. At 31 cents, it’s nearly free. You can barely buy a gumball for that these days. For $.31, you get a 2.5 ounce scoop of BR ice cream. If you have a whole family, it’s a bargain at that price per kid. And it benefits a good cause, the National Fallen Firefighters Foundation (NFFF). The Baskin-Robbins Community Foundation will donate $100,000 to that organization. And I’m confident in saying this: NONE of it will go to fund Sean Hannity’s private plane rides on a Gulfstream 5 jet. Find the Baskin-Robbins store nearest you here. I’m especially proud of this because, in 1953, two great Jewish American entrepreneurs, Burt Baskin and Irvine Robbins, founded this convenient place for all Americans to buy and enjoy ice cream in a variety of interesting and novel flavors at a time when it wasn’t as readily available. As I always note, yes, there are Baskin-Robbins stores throughout the Islamic and Arab worlds, but it’s instructive of their consistent hypocrisy: they hate “evil Zionists” Baskin and Robbins, but they love Baskin-Robbins. Enjoy your scoop. And yes, I know ice cream is high in fat and calories (and I usually stay away from it). But they only hold this promotion once a year. Live a little. Deb, some B-R’s are found inside Dunkin Donuts places. DD is known for their tough hiring policy when it comes to immigrants. And at first I was going to turn down the offer…but when the name of the National Fallen Firefighters Foundation came up, you shifted my mind a little bit. I wonder if they still have black licorice ice cream? Is B&R ice cream kosher? My wife doesn’t think so, but I do. Do you know Debbie? Also, folks, sign up for the birthday club at BR’s website. You get instant online coupons for a FREE ice cream scoop and $3 off ice cream cakes! Also, there’s a free Jack in the Box grilled sandwich coupon circulating via internet with any purchase (sandwich free with any purchase). I forgot to mention: I received my Snuggie! It was a child’s size, so I cut it up and sewed dog clothes for my rescues. After hearing about this, I went to the nearest Baskin-Robbins where the line was to the door. You’re doing better than I. I went and found the location had “closed”! So, off to the different location to redeem my free birthday cone! !